✓ Yes, Tim! I want to become a Charter Member of your profitable expert options service. 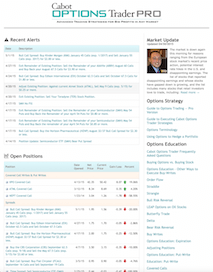 • Daily alerts from Jacob Mintz where he points out the profit opportunities in the market and keeps you up to date with what’s happening with all the open positions. I can pull the maximum profit out of each and every trade. • Access to our private Cabot Options Trader Pro website which includes the archive of all of our recommendations. • Ability to email Jacob with questions anytime. • Free bonus reports, Guide to Options Trading and Guide to Executing Cabot Options Trader Strategies, which explain how options limit risk and provide leverage and profit in any market. • The continuing education series designed to help me become a better trader and make the most profits from every trade. • A free subscription to Cabot Wealth Daily, the email advisory that features investing advice, tips and stock recommendations from all the Cabot analysts. • PLUS a complete refund if I'm not 100% satisfied with my results in the first 30 days. If you decide to join us on a monthly basis, just advise us when to terminate your membership and we’ll cancel it before the next monthly charge.